This species is accepted, and its native range is Tanzania to Mozambique. Shrub or small tree, 1–6(8) m tall. Branchlets dark red-brown, longitudinally ridged, sparsely puberulous, glabrescent. Leaves paripinnate; stipules not seen, probably very early caducous; petiole 6–9 cm long, sparsely appressed-puberulous; rachis 13–25 cm long, sparsely appressed-puberulous; petiolules 3–5 mm long, sparsely puberulous; leaflets opposite, in 6–7 pairs, 4.8–9 × 3.2–5.3 cm, broadly ovate to elliptic, apex rounded or retuse, base rounded to broadly cuneate, sometimes slightly asymmetric, sparsely appressed-pubescent beneath, glabrescent; venation slightly prominent particularly beneath. Inflorescences axillary, racemose, 18–50 cm long, simple or branched, pendulous; axis sparsely appressed-pubescent; bracts and bracteoles not seen, early caducous; pedicels 24–27 mm long at anthesis, sparsely appressed-pubescent. Calyx lobes 5, c.8 × 4 mm, elliptic to ovate, minutely puberulous inside and outside. Petals 5, white, 15–16 × 8–10 mm, elliptic to obovate. Stamens 10; filaments glabrous, three of them c.17 mm long, sigmoidally curved near the base and abruptly swollen near the middle with anthers 3 mm long, the rest 5–7 mm long, straight, anthers 1–2 mm long. Ovary multiovulate, 15–17 mm long and 1–2 mm in diameter, filiform, densely sericeous-pubescent; stipe short; stigma terminal, recessed. Pod blackish, 40–60 × 1–1.5 cm, transversely septate, terete, glabrous. Seed shiny dark brown, c.10 × 8 × 2–3 mm, broadly obovate-elliptic, flattened. Shrub or small tree 1–6 m. high. Young branchlets minutely and inconspicuously puberulous. 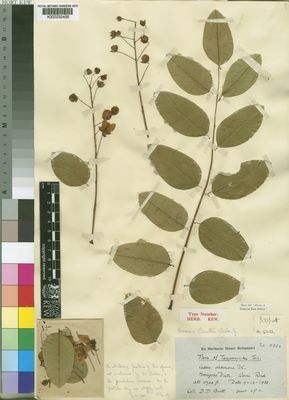 Leaves with petiole and rhachis eglandular, the latter 15–24 cm. long. Leaflets in 5–8 pairs, petiolulate, elliptic or ovate-elliptic, 3.5–10(–12) cm. long, 1.8–4.6(–7) cm. wide, minutely and inconspicuously appressed-puberulous beneath. Racemes 15–50 cm. long, pendulous, simple or branched, mostly lateral. Bracts falling while the buds are young. Petals white, 1–2.4 cm. long, 0.6–1.2 cm. wide. Stamens 10; filaments of 3 lower each with an S-bend near base and an abrupt conspicuous swelling above the bend. Pods ± 60 cm. long, 1–1.5 cm. in diameter, similar to those of 7, C. afrofistula. Seeds embedded in pulp, chestnut-brown, ovate-orbicular or suborbicular, 8–10 × 7–9 × 3–5 mm., with slight reticulate cracking. Woodland, wooded grassland, thickets; 15–800 m.
J.P.M. Brenan, Check-lists of the Forest Trees and Shrubs of the British Empire no. 5, part II, Tanganyika Territory p. 96 (1949). Bak. f. in Journal of Botany 73: 80 (1935).